The feng shui in the foyer is off and I can't seem to get it on track. Yesterday after nap time I decided to switch around the chairs and the couch. I think I like it better, but then again I'm not sure. I don't know why I'm failing at arranging this room. Sometimes I think it's because really all it is a giant hallway/pass-thru. Basically in my eyes a waste of space. No one is going to hang out in there on the furniture, sure it's pretty- pretty uncomfortable. 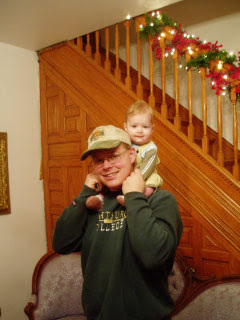 But I'm not quite in my blogging zone yet because I forgot to take before pictures so here's what I could find. They are both kind of the couch in front of the stairs because that is what bothered me the most. 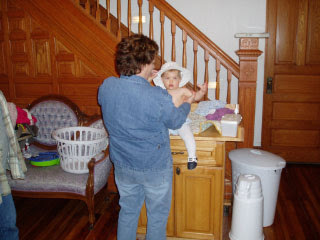 Maybe things would be better also if I could finally convince Tim to finish the downstairs bathroom and move that darn changing table in there. I think having some curtains would improve the situation, but that's a whole nother hurdle. The piano is new, well new to us any way. My aunt and uncle were nice enough to give it to us. 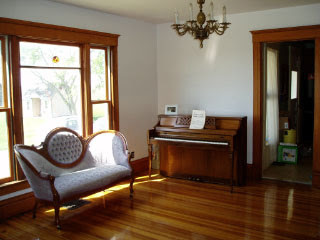 It's not the old beautiful dark-stained antique player piano that I learned on that I had planned to put there. But this one will actually hold a tune. I want Molly to have the option of taking lessons someday and I figured that this one, while it doesn't match the room, would be a better option. I can always replace it. The only problem is I don't think I'll get away with calling the guys, batting my eyelashes, and saying lets move a piano again. I'll have to think on a way to trick them, especially since the old player piano weighs about twice as much as this one- but we'll keep that one to ourselves he he. Your floors are SO shiny!! 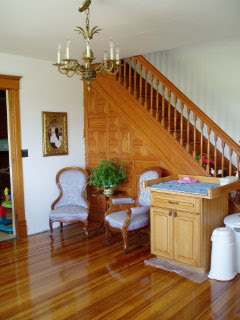 Move the changing table under the portrait on the wall by the stairs. It looks like it will fit there well. Have it facing out from the wall, not from the stairs. It's floating and it's the weight of it against the end of the staircase that's bugging you. (sorry, huge Feng Shui-er for years LOL) Then move your chairs closer to the edge of the end of the stairs. It'll work better. The other option is to turn your sofa (gorgeous btw) on an angle and put the chairs across from it - as a conversational grouping. You'll get there. Just remember not to have furniture hugging the walls.